Why do parents choose Kindergarten at the School of Saint Mary? 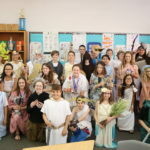 The Sixth grade class dressed up as classic Greek gods and shared baklava with their Kindergarten buddies. Kindergarten students enjoyed time with their older buddies.